Create brows that are fuller, thicker, and more defined with the e.l.f. Studio Eyebrow Kit! The pigmented wax defines and shapes brows and the color complementing setting powder keeps them looking arched and perfected. The doubled sided taklon brush has one side to help arch your brows while the other side aids in filling them in. This duo provides lasting color definition for a naturally beautiful look. 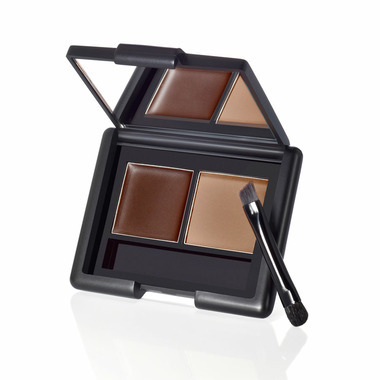 Use the pigmented brow gel to define and shape the brows with the angled brush for precise lines. Iâ€™ve spent so much on eyebrow powder and this one is my absolute favourite and costs a fraction of the cost. It lasts a long time too. Too heavy of coverage for me (I like a more natural look) but my friend loved it! She likes to really fill in her brows so it worked good for her. Not recommended for natural coverage. I really like it. Although I think it's a bit dark for a light. But I think I'll get used to it. Best brow kit out there. I was worried the gel-like brow contour would just melt off or with my oily skin, cause it to slide off, but there are no worries about that with the setting powder beside it. it really locks it on. The consistency of the brow contouring side along with the angled, sharp-edged brush, really allows you to create brows that look real where your brows are really sparse. Can't believe it sells for $4.99 even when not on sale. This brow product is just as good as any higher end products. I really love this and will re-purchase! Bought this originally from Meijer in the states and loved it and found it on well.ca it's awesome!. If you are trying to match it to blond eyebrows it would be really dark. I do use the lightest option and i have medium brown hair. It looks very natural it is a gel though which is a little harder to deal with but turns out good. I do use a different angled brush to put the powder on.....but overall great product!! This is a bit heavy and is hard to apply to get the natural look. If you need a painted look for your brows, this will work for you. The brush does shed a bit. The colour is darker than I thought, but I am learning to work with it and apply it as needed.